Cannabidiol (CBD) is a compound in cannabis that has medical effects without delivering the psychoactive effects that THC does, and actually counters some of the effects of THC. The reduced psychoactivity of CBD-rich cannabis may make it an appealing treatment option for patients seeking anti-inflammatory, anti-pain, anti-anxiety and/or anti-spasm effects without disconcerting euphoria or lethargy. Scientific and clinical studies indicate that CBD could be effective in easing symptoms of a wide range of difficult-to-control conditions, including rheumatoid arthritis, diabetes, alcoholism, PTSD, epilepsy, antibiotic-resistant infections and neurological disorders. CBD has demonstrated neuroprotective effects, and its anti-cancer potential is currently being explored at several academic research centers in the U.S. and other countries. This product is Lab-tested in a Health Canada approved testing facility. ** Please store in the refrigerator for quality assurance. The capsules that contain the oil product are sensitive to heat. As such, customers are advised to keep capsules, whether individual or in the container bottle, out of direct sunlight and in a cool location. 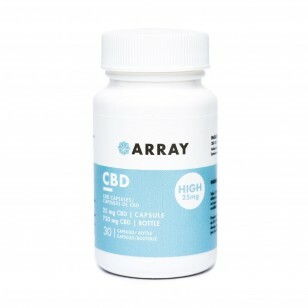 Array CBD Capsules - 25mg CBD (30 Count Bottle) 25mg CBD per capsule 30 capsules per bottle 750mg CBD per bottle Cannabidiol (CBD) is a compound in cannabis that has medical effects without delivering the psychoactive effects that THC does, and actually counters some of the effects of THC. The reduced psychoactivity of CBD-rich cannabis may make it an appealing treatment option for patients seeking anti-inflammatory, anti-pain, anti-anxiety and/or anti-spasm effects without disconcerting euphoria or lethargy. 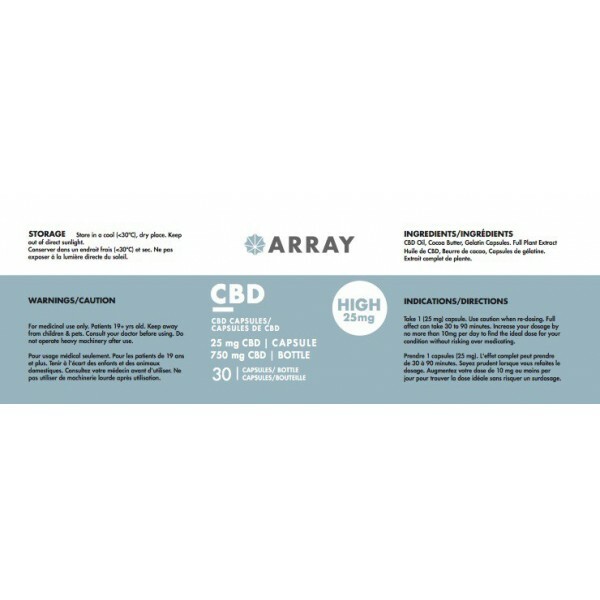 Scientific and clinical studies indicate that CBD could be effective in easing symptoms of a wide range of difficult-to-control conditions, including rheumatoid arthritis, diabetes, alcoholism, PTSD, epilepsy, antibiotic-resistant infections and neurological disorders. CBD has demonstrated neuroprotective effects, and its anti-cancer potential is currently being explored at several academic research centers in the U.S. and other countries. 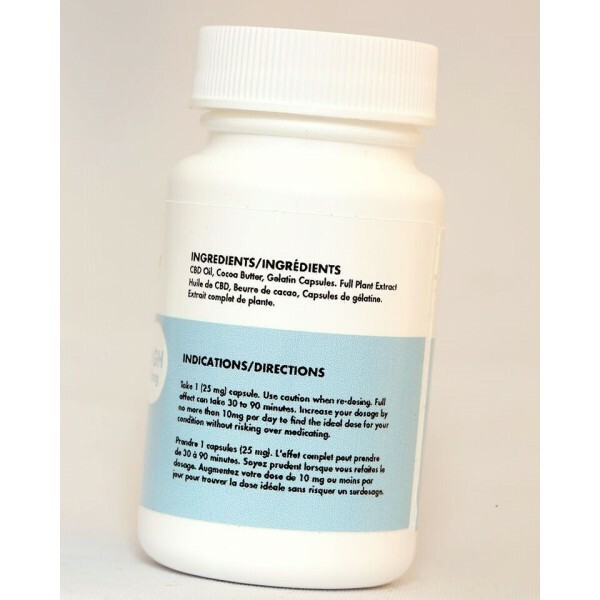 This product is Lab-tested in a Health Canada approved testing facility. ** Please store in the refrigerator for quality assurance. The capsules that contain the oil product are sensitive to heat. As such, customers are advised to keep capsules, whether individual or in the container bottle, out of direct sunlight and in a cool location.